We have received many requests from parents, asking if we would develop a series of period clothing for their children, so they can look equally as fantastic, when attending the faire as a family. The same high quality you've come to expect from Museum Replicas has been given to this entire line of spectacular clothing. Monk's Robe Be you be a man of the cloth or rogue in hiding, this is a perfect outfit for traveling the roads of any renaissance festival. 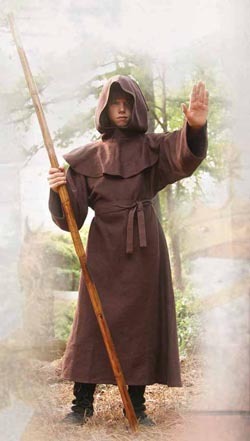 Made of a heavy 100% brown cotton weave, this outfit is as durable as it is foreboding. A full generous hood and belt complete the ensemble. 46" long. Dry clean. One size.